Title: "Good Bye, Dad, I'm Off To Fight For Old Glory"
Comments: Son in uniform with a gun shakes his father's hand good bye and encourages him to buy bonds. Nice scene behind them of farming country with cleared fields and forests. 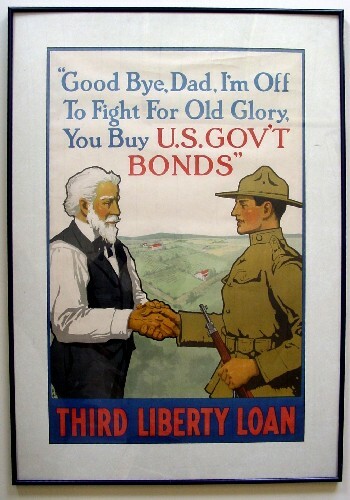 A nice promotion to encourage the purchase of government bonds for the Third Liberty Loan campaign. Condition: Very Good, framed and matted.